If you like Korean food, you probably like bibimbap. 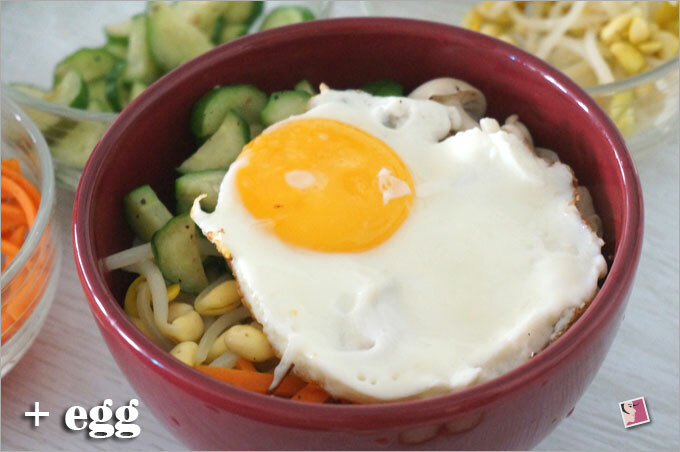 Today, I wanna share an easy-to-prepare and absolutely delish bibimbap recipe with you. If you haven’t tried Korean bibimbap, I urge you to give it a try. Don’t make the same mistake I did, resisting the dish and refusing to try it even when I was in Korea last year. It was not until I ate the authentic version when I visited the Korean DMZ this March that I realized what I was missing out on. The good news is, you don’t have to head to Korea to try bibimbap. You can sample the mouthwatering dish at most Korean restaurants. Just don’t eat those served at food courts because they usually taste awful. For those unfamilar with Korean fare, bibimbap is a signature Korean dish that translates to â€œmixed rice” topped with meat and assorted vegetables. You can make endless variations to this dish depending on your preference. If you are vegan, just omit the meat. But just to let you know that traditional and authentic versions of bibimbap are served with raw beef and raw egg yolk along with other vegetables. As I’m don’t like raw food that much (except for sushi), what I’m about to share involves cooked ingredients. Oh, before I forget, I need to highlight that Korean bibimbap tastes best when served on a dolsot, which is really a hot stone bowl. I’d originally planned to get a dolsot before sharing this recipe but obviously, never got down to acquiring one. But with or without a dolsot, I guarantee you’ll love my easy recipe. I use only five main ingredients with this recipe. No meat. I noticed the Koreans use soya bean sprouts and since these are available at NTUC Supermarket, I decided to include them. Personally, I’m not a fan of these big-headed bean sprouts. No doubt the heads are crunchy but I’m still getting my tastebuds around its distinct taste. A trick I’ve learned though is not to add too many in my bibimbap so that the taste is not too overpowering. To prepare, you’ll need to pluck out the roots and blanch them–put a bunch inside boiling water with some salt for about three minutes before cooling them off. 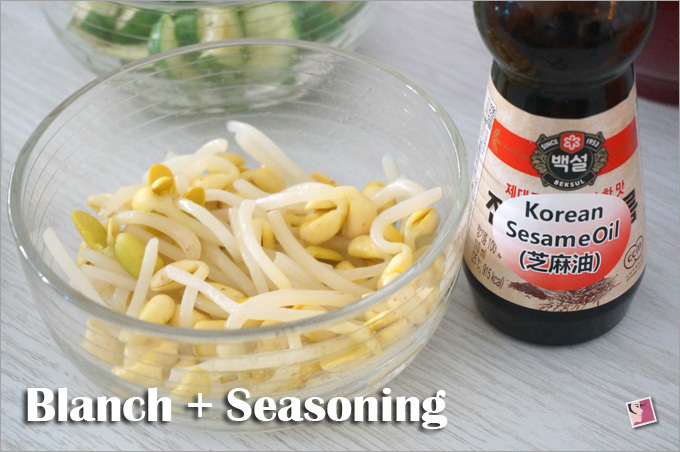 Then mix them with about one tablespoon of sesame oil to make the bean sprouts flavorsome. Set aside. Next, cut some strips out of carrots. Blanch them in the same boiling water with salt for three minutes before cooling them off. 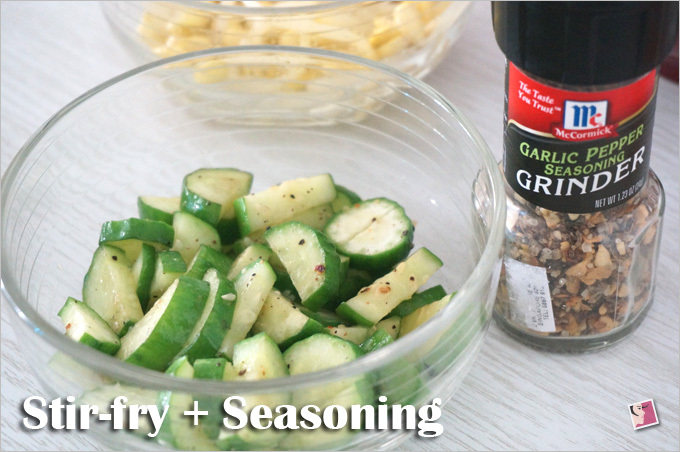 Stir-fry with some garlic pepper seasoning without using oil and set aside. As you can see, I’m advocating the seasoning from McCormick. I mean why jump through hoops when this hassle-free, ready-to-use seasoning is so neat? You cannot eat bibimbap without the crunchy Japanese cucumbers. In fact, this ingredient is the easiest to prepare. All you need is to slice some Japanese cucumbers into rounds and halve them. 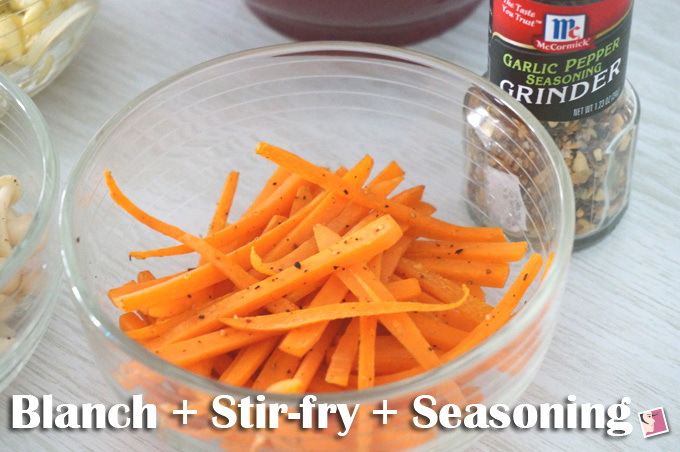 Stir-fry with some garlic pepper seasoning without using oil and set aside. 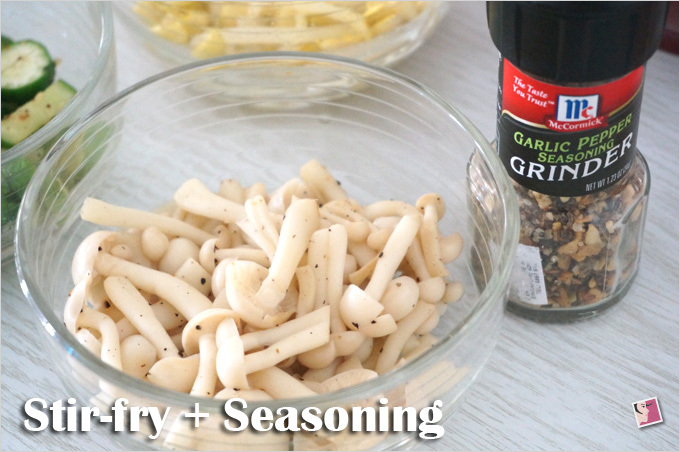 Do the same for the mushrooms–stir-fry with some garlic pepper seasoning without using oil and set aside. I like these bunapi mushrooms and I find they taste great for this recipe but you can use other types of mushrooms according to your preference. I like to use with bunapi shimeji too as the little heads makes the biting and chewing most satisfying. Instead of white rice, I find that bibimbap tastes best using grains that are chewy. So mixed grain or short grain brown rice are ideal. Basically, the more chewy the grain, the tastier the bibimbap. I’m not saying you can’t use white rice. You can. But it just won’t taste as great. 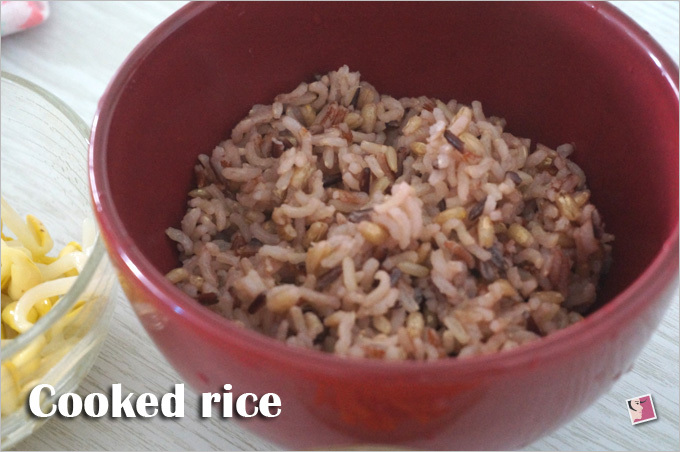 Over here as you see on the picture, I have brown, red, black rice and pearl barley. But I love my bibimbap served with Japanese brown rice. 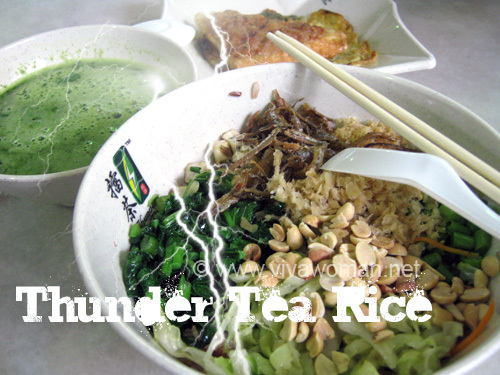 If you haven’t had the chance the try Japanese brown rice, I urge you to give them a try. Those grains are simply ma-si-sseo-yo (Korean word for delicious). 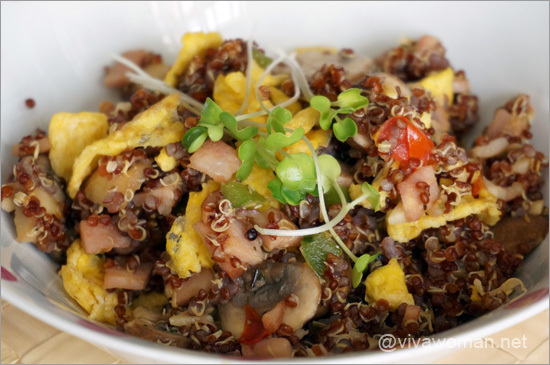 Place the assortment of vegetables and mushrooms on top of the rice and top the dish with a fried egg with a soft egg yolk. You can also use poach egg. 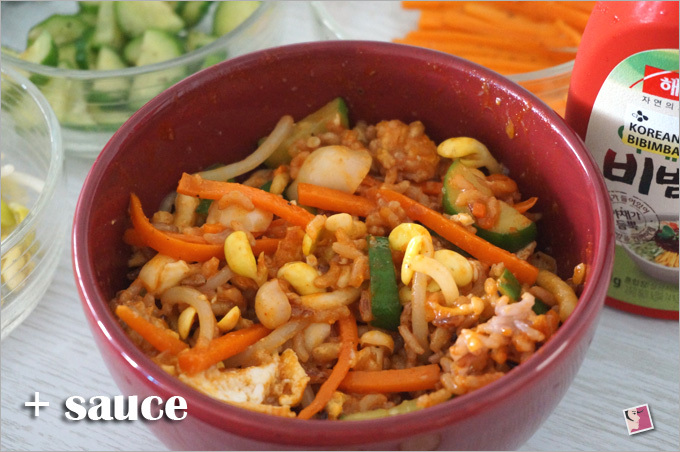 Finally, add the bibimbap sauce, mix everything up and the bibimbap is ready to eat. How much sauce you wish to add depends on your taste but I suggest adding gradually until you’re satisfied with the results. 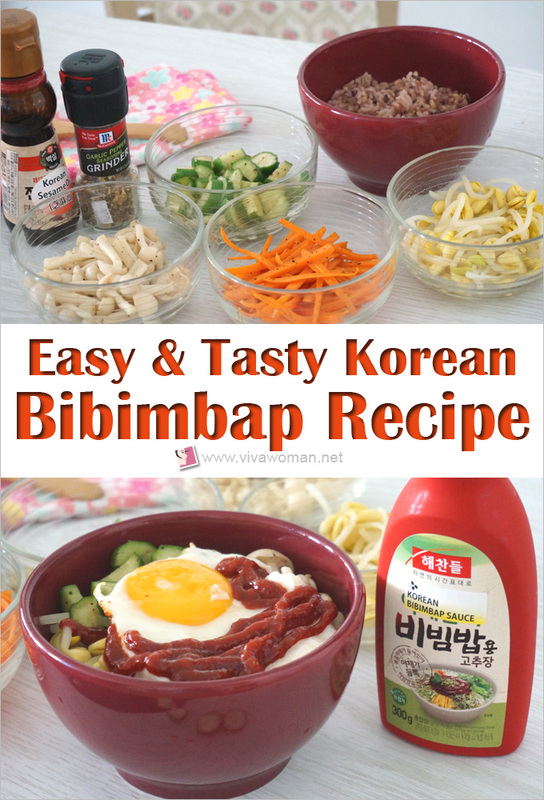 If you’ve never eaten bibimbap, you’ll like to know that the sauce is lightly spicy. Okay, I know you can make the bibimbap sauce from scratch but seriously why bother if you can buy it? Like I mentioned, hassle-free, ready-to-use seasoning is always handy. And for those who need to know, I got the sauce at the Korean section in NTUC Supermarket. Korean bibimbap taste best when served fresh. That’s why the dish taste great when served in a dolsot. The rice doesn’t get burned but the heat does make the rice “crispy” so to speak. Bibimbap is not difficult to prepare but I’ve to say it’s time consuming. As you can see, each ingredient needs to be prep separately. All in, the preparation can easily take up 45 minutes or more of your time depending on the number of ingredients you add and how quickly you work. Instead of just those vegetables I’ve mentioned, you can also add more greens like spinach or you can use seaweed too. 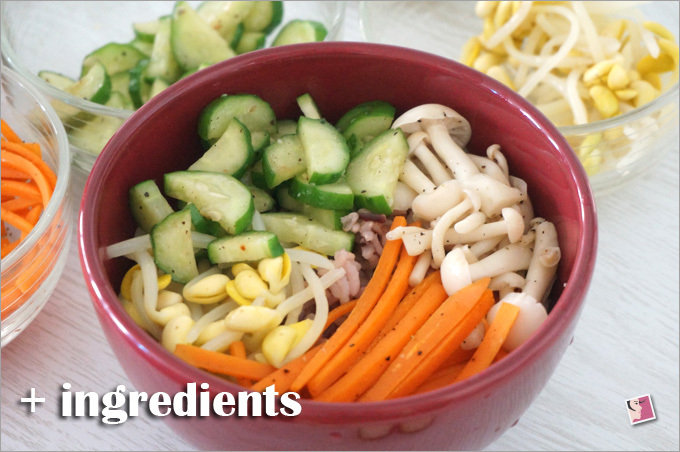 But whatever you add, make sure your bibimbap has a combination of ingredients that make the dish chewy, crunchy, and if possible, crispy too. So do you love Korean bibimbap? Where have you eaten the best? In Singapore, Ju Shing Jung Korean Charcoal BBQ serves a decent dish of bibimbap in dolsot for something like $14 if I remember correctly. If you know of anywhere else that serves great bibimbap, do share. Hi, may i know where can i buy the bibimba sauce from? If you’re based in Singapore, you can find it at NTUC especially NTUC Finest. 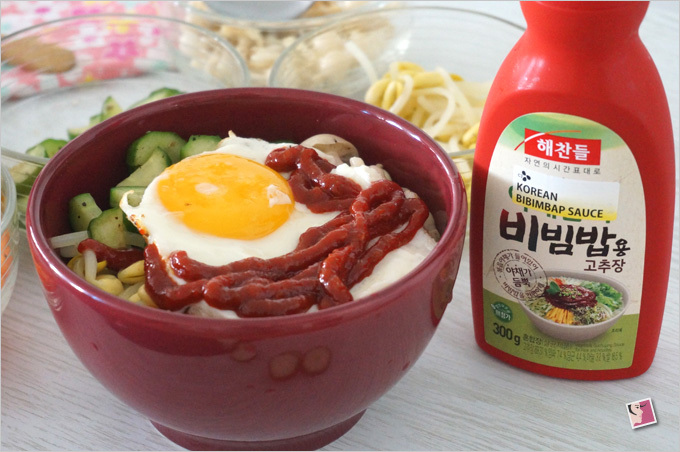 Is the bibimbap sauce in the picture a bit sweet? I tried bibimbap two times at a food court and I liked it without the (sweet) sauce. The dolsot gives a nice taste to the rice.